Check out Professor Steven Manly's new book surveying 11 different multiple universe concepts! 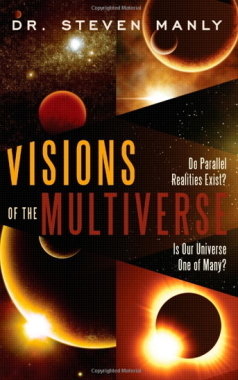 Visions of the Multiverse was released in February 2011 by Career Press/New Page Books. The idea of a multiple universe reality is no longer considered speculative or implausible by many physicists; rather, it is deemed inescapable. Distinct concepts of the multiverse spring from quantum mechanics, cosmology, string theory—based cosmology, and ideas about a mathematics based reality that borders on the religious. In this accessible and entertaining book, Prof. Manly guides you on a tour of the many multiverse concepts and provides the non-technical background to understand them. A wide variety of fascinating concepts—from relativity and fundamental particles and forces of nature to dark matter, dark energy, and quantum mechanics – are covered in an unintimidating and conversational tone. Just what is a multiverse? What are the different concepts of the multiverse and how are they related? Is it possible to determine if we live in a multiverse...or even in multiple types of multiverses? How do religious concepts of the afterlife and popular ideas based on the law of attraction relate to the scientific visions of the multiverse? Is humanity is in the midst of a new Copernican revolution? Spend some time with Visions of the Multiverse and decide for yourself.